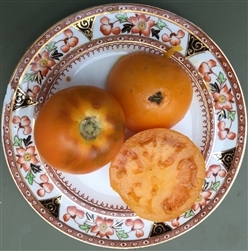 Vibrant yellow tomato, with excellent well balanced flavour, not too sweet and not too tart. Fruit grow to 3”. A New Zeland family heirloom brought to the UK by the 7th Earl of Edgecombe. The 7th Earl, a former sheep farmer, brought the tomato back from New Zealand in the 1960s when he claimed the title. He gave the seed to the Henry Doubleday Foundation. We got it from the lovely Jean Perry of Glebe Gardens in Baltimore.